Foodie Call #1 took place on Tuesday, November 24, 2009. Kate had heard Gary raving about the rich, salty calorie bomb that was the artichoke slice, the eponymous slice at Artichoke Basille in the East Village. She decided then that Artichoke would have to be their first foray in foodie adventure. Top – the kitchen at Artichoke Basille. 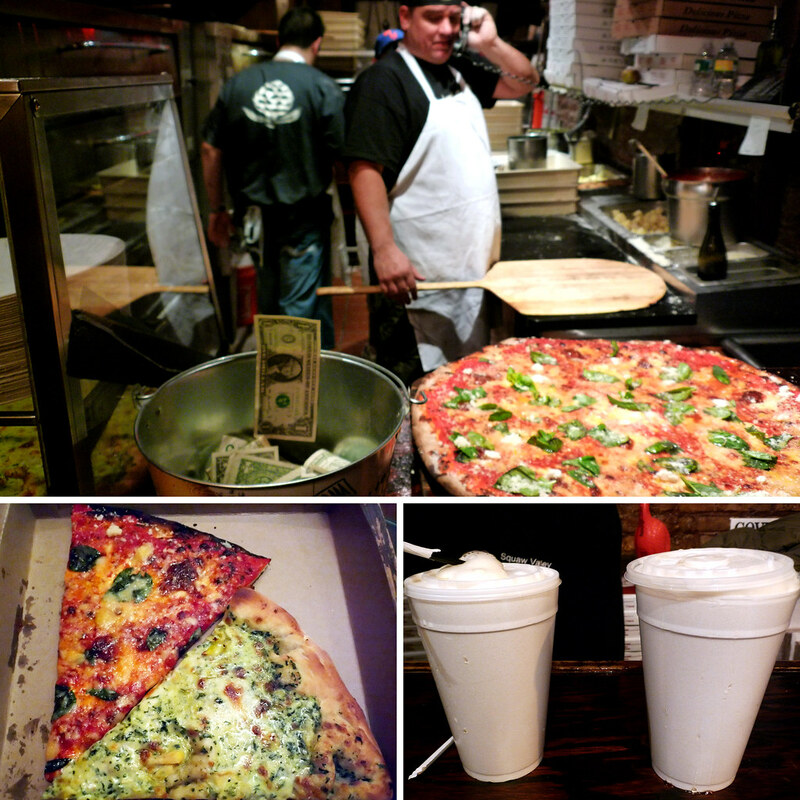 Bottom left – margarita and artichoke slices. Bottom right – two 32 oz. Bud Lights. Gary: Shockingly, there was no line when we got to Artichoke. After so many times passing by and seeing a line form out the door, I was actually caught off guard by having to order so quickly. Thankfully, ordering pizza ain’t exactly rocket science so we quickly put our orders in for one slice each of the margarita and the artichoke. For beer, they only had Bud Light but, at $5.50 for 32 ounces, one can hardly complain. 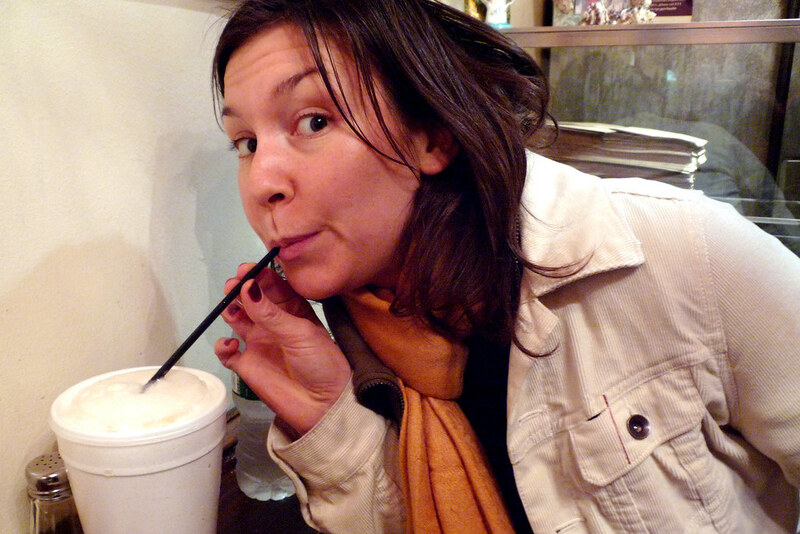 The method of service for the beer at Artichoke is decidedly white trash – giant styrofoam cups, lidded, and a straw. It’s to their credit that they fill those suckers up to the top, so much so that you can’t even get the lid on it until you take a few sips out of beer. Kate: I walked in and set my eyes on the famed artichoke slice I had heard so much about. The slice that attracts a line out the door. At 1,600 calories, I was prepared to see something gargantuan. The slices on the pie looked large, but not blow-my-caloric-wad-for-the-day kind of large. Gary and I had discussed splitting one, but I thought we should get another slice of something for good measure. I had just come from yoga class and was ravenous. Kate sips her Bud Light through a straw. Gary: After a few minutes of warming in the oven, we had our slices and were ready to chow down. First up was the artichoke slice and it was a disappointment from the last time I’d had it. It still had that rich, creamy, buttery flavor but it was sorely lacking in salt. I actually thought it was tad too salty the last time I had it; I definitely did not have that problem this time. The Margarita, on the other hand, was perfect – tasty tomato sauce and the sprinkled parmesan that crisped up in the oven added some desired saltiness. Still hungry after splitting the two slices (I blame that on the beer), we ordered a Sicilian slice which was okay but I think it suffered from sitting in the pan for so long, allowing it to soak up a lot of grease. Kate: First of all, normally I turn up my nose at Budweiser, but I was so thrilled to be drinking any beer with my pizza (unlike your typical corner slice joint), that I seemed to be able to choke it down. Quickly. The artichoke slice was “meh.” It tasted sorta… fatty (that’s the only way I can think to describe it). I’m not anti-rich, if it’s done well. Creamy and flavorful is good–straight fatty is bad. I salted it (which is standard when I eat pizza), and it improved. My thoughts as I was eating were: “Okay, so check this off the list. Had the hyped slice, don’t need to have it again.” It wasn’t something that I would think about later and want to come back for. However, then I tucked into the Margarita. Oh hello there Margarita. 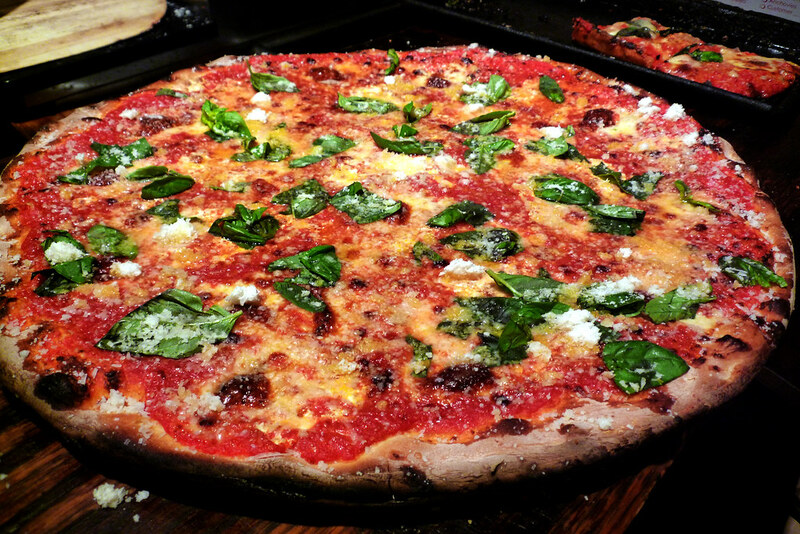 Flavorful sauce, great cheese, fantastic crust, nice fresh basil, and the parm on top sealed the deal. I salted it, but it actually didn’t really need it. Really good. The Sicilian, as Gary said was really greasy in the crust. I ate it, but felt kinda crappy afterwards. I wished we had split another Margarita. Kate: My favorite part of the experience was the Bud in the styrofoam cups. I’m kitschy like that. Would I make a special trip back there? Probably not. Am I glad I tried it? Sure. If I ever happen to be there again enjoying a tasty margarita slice and someone I’m with is having the artichoke slice, would I beg them for a bite for further research and comparison purposes? Why, yes. Gary: Like any place, the experience can vary based on when you go and how fresh the pizza is. That’s probably what ruined the Sicilian slice; perhaps a fresh slice would have tasted better. The artichoke, however, did not have time as an excuse, instead it was guilty of under-seasoning. I’d try the artichoke again if I were doing two slices for a meal but if only in the mood for one, I’d go with the Margarita. Artichoke Basille’s Pizza & Brewery. 328 East 14th Street, New York, NY 10003. [Show/Hide Map] (212) 228-2004. Just had the artichoke slice and it was very good, I’d never heard about it before being from out of town and stumbled into it and I was so surprised by the creaminess and richness of it. 1600 calories though?? No way, tasted like 700-800!